Florence Munguti was an ABCF fellow at BecA-ILRI Hub in 2014 when she began her study to identify viruses associated with passion fruit woodiness disease. In Kenya, the passion fruit is one of the top three export fruits, coming close behind the mango and avocado in terms of foreign exchange earnings. It is grown mainly by smallholder farmers for subsistence and commercialization and has great potential to alleviate poverty due to its high market value and the crop’s short maturity period. However, many farmers are making great losses due to the devastating effects of the woodiness viral disease that stifles passion fruit production. This makes it one of the most dangerous diseases of the purple passion fruit. In November 2014, she began her study with the collection of passion fruit leaf samples already showing symptoms of the disease in Njoro, Nakuru county, Kenya. 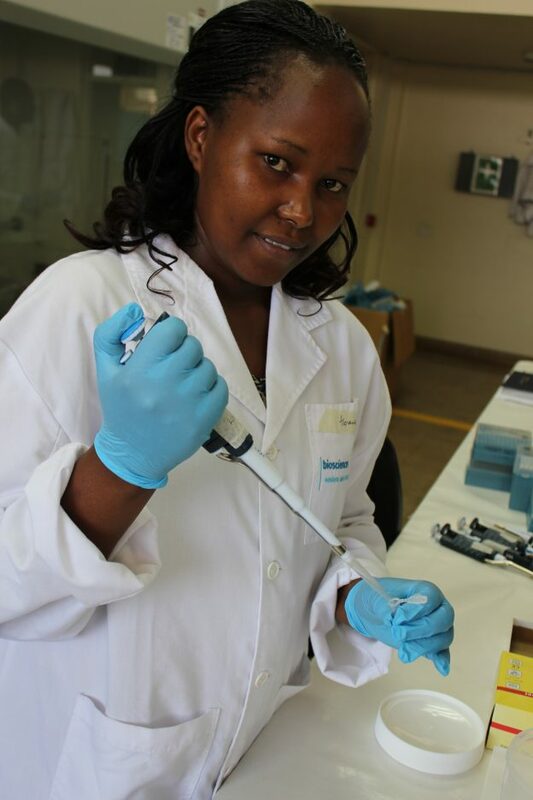 At our laboratories, she used next generation sequencing to identify viruses associated with passion fruit woodiness disease in Kenya. The sequence analysis revealed the presence of complete genome sequences for Cow pea aphid-borne mosaic virus (CABMV) previously associated with woodiness viral disease in Kenya. Woodiness disease is caused by the CABMV, transmitted by sap sacking insects such as aphids and mites as well as using infected tools in the management of the crop for example during pruning. The disease is characterized by light yellow discoloration on the leaves and a woody hard fruit, hence the “woodiness” name.